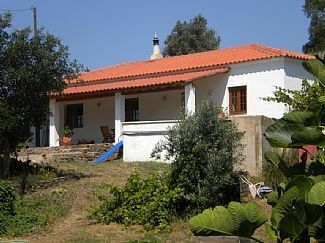 Casa Amora is an easily accessible beautiful cottage in the hills of the northern Algarve. It's location is ideal for walking, cycling, birdwatching or relaxing in the countryside. The house has solid oak flooring in the bedrooms, double glazing and a wood burner making it ideal to stay all year round. Traditional high ceilings made of eucalyptus and pine. This newly renovated house is set in its own grounds of 3500sq.m with grapevines, olive and fruit trees. There is a plunge pool with a shallow area for children and a large built in brick barbecue. Parking for 3 vehicles. Matt and Jill with their two boys renovated and then lived in Casa Amora for several years. It's cosy ambience reflects that it was a family home. We fell in love with the peaceful location with easy access to schools, shops and restaurants in Sao Marcos da Serra within a 5 minute drive. Although Casa Amora is situated in the rolling hills of the northern Algarve it is still possible to be in a shopping mall or on the beach within half an hour to an hour's drive. En-suite shower room to master bedroom with toilet and hand basin. En-suite bathroom to bedroom 2, bath with shower attachment, toilet and hand basin. Washing machine. Heated towel rail. Please bring pool and beach towels. Woodburner, limited TV, DVD and CD player. 3 seater sofa and basket chair. We make sure there is tea, coffee, sugar and bottled water available. A starter pack of provisions can be provided on request payable direct to house keeper. Kitchen diner with cooker, fridge/freezer, microwave, toaster. Table and chairs. A few DVD's are left for guest use. There are a few toys please ask the housekeeper as they are kept in the storage. The garden is not fenced. There are 2 sun loungers for guests. The covered veranda has a table and chairs for dining. Outside: Large covered veranda with table and chairs. Plunge pool with shallow area for children. Patio area with large built in barbecue. In 3500sq.m of land there is an original working well (covered) featuring the old wheel, grapevines, olive and fig and various fruit trees. Cleaning / Towels / Linen / Maid service: Towels and linen provided. Maid service once a week and towels and linen changed once a week. Shame about the persistent dog who had made themselves at home. Lovely home, spacious, great plunge pool, very well equipped, lots 0f toys which was great bonus for our little boy. Good to hear that you enjoyed the pool, the toys and had everything you needed. Please accept my apologies for the 4 legged visitor and I'm glad you contacted me about this at the time. I understand the water pistol was a good deterrent! This cottage has been beautifully renovated and had everything our family needed to relax, swim and eat in a lovely rural environment. I made sourdough in the sun and took our children on a donkey trek in the land behind the cottage with a neighbour. In the evenings, a farmer drives his flock back past the house and the ringing bells is a great accompaniment to an evening glass of wine or two. The pool was just right to cool down in, and there was a stellar selection of jigsaws and board games. Thank you! I'm so glad to hear that our cottage is welcoming and you enjoyed your stay as much as we did living there. It certainly is a lovely spot to get away from it all. Peace and tranquility - if that is what you are searching for this is the place to stay. No neighbours except sheep and donkeys, only noise is the crickets at night and the star gazing is amazing! House nicer than pics, very clean and spacious. Plunge pool just right for cooling off! No tv or wifi so total escapism! Books, games and DVDs to use. Very rural location -local town São Marcos has a couple of shops and snack bars. Silves and Aljezur both worth a visit. We totally switched off, basked in the sun and loved the total peace and tranquility. Wir haben im Juli/ August 2018 zu viert drei Wochen in diesem Haus verbracht. Für unsere Kinder war der Pool ideal und die Umgebung spannend. Die große überdachte Terrasse war ideal um den ganzen Tag auch bei größter Hitze im freien zu verbringen. Der Kontakt zu den netten "housekeeper" war auf Grund des schlechten Telefonempfangs nicht ganz einfach, und doch zwei mal nötig. Wir hatten sehr viel Zeit für uns allein und haben die Zeit sehr genossen. In der Beschreibung des Hauses ist alles treffend formuliert, man sollte sich also auf die größere Entfernung zum nächsten Ort, auf den Verzicht auf WLAN und die fehlende Klimaanlage einstellen. Dann ist es traumhaft. Thank you for your review. We're glad you and you family had a good holiday. We try to emphasize that the property is quite rural, 6km to the village, but it's possible to be in a town or on a beach within 35/45 minutes. Wir sind ein Ehepaar mittleren Alters und habe schon einige Ferienhäuser gemietet. Das Casa Amora war allerdings eine sehr ungewöhnliche Erfahrung für uns. Eine persönliche Begrüßung und Erklärung des Hauses oder eine Kontaktaufnahme während unserer Anwesenheit fand nicht statt. Dass im Pool die Farbe und die Kacheln abbröckeln und die Sonnenliegen so vergammelt waren, als wenn diese im Schlamm gelegen hätten, könnte man noch gerade so akzeptieren. Aber dass ein Sonnenschirm fehlte und die Wasserpumpe für die Küche und die Bäder ständig ausfiel und anstatt eines SAT-Fernsehers eine DVD-Sammlung bereit lag, die u.a. Filme aus dem 2. Weltkrieg (aus englischer Sicht und in englischer Sprache) enthielt, war schon sehr befremdlich. Ein besonders krasses, negatives Erlebnis war das jeden Abend über mehrere Stunden andauernde Knacken und Knistern in der Dachkonstruktion, was einsetzte, sobald die Sonne untergegangen war. Da war ohne Ohrenstöpsel nicht an einen erholsamen Schlaf zu denken. In der unmittelbaren Nachbarschaft standen verlassene, teilweise verrottete Gebäude und Schuppen. Es wirkte auf uns wie in einem düsteren, gespenstischen Film. Das Grundstück selbst wirkte sehr stark ungepflegt. Da es nicht eingezäunt und abgeschlossen ist, wurde es regelmäßig von Schafen überrannt, die auch noch die letzten grünen Blätter von den Büschen und den kleinen Bäumen abfraßen und das Wasser aus dem Mini-Pool tranken. Dafür ließen sie unzählige Köttel auf den Boden fallen und zertrampelten das komplette Gelände. Abschließend bleibt noch zu erwähnen, dass es im großen Bad kein Insekten-Schutzgitter gab und dadurch eine ausreichende Lüftung nicht möglich war. Mehrere Deckenlampen waren defekt und die über dem Gasherd war nur notdürftig festgeschraubt. Durch Zufall haben wir schon vor unserem Aufenthalt erfahren, dass das Ferienhaus verkauft werden soll. Deshalb waren und sind wir umso mehr enttäuscht, dass es nicht annähernd so aussah, als wenn es für einen Käufer oder wenigstens für Urlaubsgäste rausgeputzt worden wäre. I was disappointed to read your review and would like to address some issues. As we do not live near the property we rely on a housekeeper and maintenance man to meet our guests and resolve any problems. They are old friends and take care of the house, land and guests with great care. He called round but found no one home and they did not receive any phone calls from you during your stay. I understand you had problems with mobile reception- I'm afraid this is very much reliant on which company you are with but previous guests have not had any issues we were aware of. A short drive up the lane or to the village and I'm sure that you could have made a call. The website clearly states "limited TV" and DVD's are available. The DVD's which were bought in Portugal can all be adjusted to different languages, French, German, Norwegian etc but I'm sorry there was nothing to your liking. The crackling sound in the roof is due to the fact that the house is built in a traditional Portuguese style which means "mud" walls, wood and eucalyptus roof, after the heat of the day the beams creak as they cool down. There is very little that can be done about this and most guests appreciate this as the character of the cottage. I apologise that there was no parasol, things do get broken during the busy season and I have asked that this and the sunloungers be replaced before next spring, the same for the insect screen you mentioned. The water pump has been checked and is in working order, again this is something which could have been brought to our attention while you were staying had we been made aware of it. I do not feel the house is neglected and though it was briefly on the market we have always made sure that guests have what they need for an enjoyable and comfortable stay. If guests visit with pets we always make sure they are aware that the land is not fenced and that the local shepherds sometimes come by, they are more than happy to avoid the land when asked. As for the abandoned buildings in the area I'm afraid much of rural Portugal, as with other European countries, has found in recent years that people want to live in the towns and cities. Ourselves and guests alike have enjoyed the opportunity to get away from it all, making the most of the peace and quiet and not have lots of neighbours on their doorstep. Foi a semana ideal para descansar do stress da cidade. Desfrutar de bons momentos em família. Muito obrigado à família Clarkson. Thank you for your review, many guests agree it's the perfect place to de-stress. The nearest beaches are at the popular resort of Albufeira on the south coast - a drive of 40 minutes. Zambujeira, a typical Portuguese seaside town on the west coast is situated in a national park and takes 50 minutes by car through stunning scenery. The west coast boasts world class surfing beaches. Faro airport is a one hour drive. The new Beja airport is a one and a half hour drive. Casa Amora is 5kms from the pretty village of Sao Marcos da Serra which has several convenience stores, a bank with ATM, chemist, post office, cafes and restaurants. Monchique is a scenic drive away through the mountains and the old town of Silves has a Moorish castle. Booking Notes: A deposit of 25% with the final payment 8 weeks prior to arrival. Via email or telephone. Alternatively book through the website. Check in is after 3pm Check out is 10am Changeover Day: Any day.